There’s so much on my heart from my recent month in Bali. Every trip I take and adventure I go on is unique, but this one was extra special, because it was the complete opposite of what I’d expected, and incredibly challenging for me. I expected this trip to be relaxing — even healing for me. When I think of Bali I think of natural beauty, temples, yoga, relaxation...basically an Instagram paradise (hehe)! Within the first few days, I was attacked and bitten by a monkey twice (and now I’m going through a series of painful shots to avoid rabies and other potential diseases), my bedrooms were filled with loud, mating lizards, giant, speedy spiders, and even a large black rat, and the main cities in Bali (Ubud, Changguu) are noisy, busy, chaotic. It simply was not what I’d expected at all. In this post, I want to share with you how I was able to turn it all around, and some eye-opening lessons from the experience. A big theme that came up for me over and over was taking notice of whether your environment is serving you or not. And, if its not, change it when and if you can! Not to get all woo-woo, but the power of taking life by the reigns and creating the experience you desire is everything. After about a week of struggling and not having a good time in Bali, I considered calling it quits and flying home. And I almost did. This was a turning point for me. As tempted as I was to leave, something in my soul was telling me that my time there was not up, and the lessons I had to learn weren’t complete yet. I could feel it in my bones. So, I made an intentional decision to continue this path... monkeys, lizards, spiders and all. With this new intentional decision making approach, the first thing I realized was that I needed to get out of the hustle and bustle of the busy city and to the nearest body of water for some R & R, in order to hit the reset button (oceans/lakes are my happy place). So I left Bali for the Gili Islands, where cars and motorbikes are not allowed, and surfing, paddleboarding and yoga are plentiful (so I did all three). The water was the bluest I’ve ever witnessed. The sound of waves crashing filled my heart and soul. I spent time connecting, processing, regrounding. This may at first glance seem a little opposite of my first point, which is more about taking control and creating the experience you desire, as you are able, as much as you can. And as there’s always a yin with a yang, there are obviously certain things we cannot control, and that’s where “flowing” comes into play. It’s a balance. A beautiful dance of ebb and flow. I had to both shift what I could and surrender what I couldn’t. I had to accept what was, and flow with it, while remaining focused on the positive, and trying to recognize and accept the lessons in it all. I didn’t like the creatures in my bedroom, but at least they aren’t snakes. 🙂 I’m not a fan of coffee grounds in my coffee, but at least I have coffee. I yearned for hot water for my shower, but recognized that the people here take cold showers every day. I am blessed. Something I’ve been working on lately is increasing my intuition. That little “voice” that comes from a deep knowing that knows exactly what to do. Mine can get crowded out with all of my thoughts (maybe you can relate? ), but I’ve been trying to clear out the clutter so I can hear it more often, and more clearly. Let’s talk about the time I got attacked and robbed… by a monkey. Monkeys roam the streets in Bali, and the monkey forest is the the area where most of the wild monkeys reside. I entered the forest with a friend, and after hanging out with the monkeys (letting them hop onto our shoulders and snapping a few pictures). After a little bit, I mentioned that I felt complete and was ready to leave whenever. But, we just kept walking and exploring. Then, a monkey jumped onto my back, unzipped my backpack, and wrapped his little fingers around the phone that was inside! It was a close call, but I escaped— and with the phone. I said, “I’m ready to go, where’s the nearest exit! ?” But… we continued to walk, hoping to shake off that moment. Just before we walked onto this little bridge where my friend did a yoga pose and I snapped a picture, I said, “You know, maybe we should go. I’d hate to not leave and have something happen and later regret not leaving sooner.” I LITERALLY SAID THOSE WORDS! That was the THIRD time I voiced the inkling that we should leave. I should have listened. What happened next is a bit of a blur. I was holding her bag while she posed for the picture, when a little monkey started tugging on it, trying to steal it from me. I pulled back. Then a much larger monkey (his mama?) came from the side and grabbed my ankle and sunk its teeth into my skin. I was still determined to keep the bag, so I kept tugging while flinging this monkey off of me. The second monkey attacked another time and latched onto my ankle, biting me and drawing blood again. My friend told me to let go of the bag and let the monkey have it. I was very shaken up, to say the least. Next time I will listen to that little voice, that certainty in my soul, that tells me the next thing to do, the next step to take. I find it interesting that I had voiced three times that I was ready to leave. No one is to blame for not leaving but how interesting is it that I had that little nudge —so much so that I even said it aloud, not once or twice but three times. This was a good lesson for me… even if it ended up being more painful that I would have wanted. Something in my body or spirit knew. Next time I listen. Living in a third world country has brought me to my knees and back to the basics in more ways that I can count. Throughout all of the trials, I established a new sense of gratitude. In Bali it was two weeks before I was able to take a hot shower. That shower practically brought me to tears, I was so happy. I make a gratitude list every morning of 3-5 things/people/blessings I'm grateful for. Normally that list consists of opportunities, a person, sunshine, or coffee. Lately, that list has been much simpler: hot showers, clean water, sidewalks, hair dryers, air conditioning, English, heavy cream, mirrors, not having lizards or spiders or rats in my room. Newfound appreciation for what you have is something that never gets old. In this very moment, I’m sitting in my clean apartment thinking about how I’m living and breathing, and so are you. I’m so thankful for this day. I’m so grateful to be here. Please God, grant me the ability to not take a single day, a single moment, for granted. Meeting people to do life with—whether in your neighborhood or while you’re traveling is KEY. Connection is something every soul desires. Sharing life with others makes the hard times easier and the great times greater. Near the end of my trip I connected with a few really awesome people in Bali, and the whole experience changed. I personally experienced how being around the right people can make any outside circumstances tolerable, manageable, and even enjoyable! It really solidified for me exactly why we’ve built such an incredible community within our virtual weight loss program. The one thing that was missing from our private VIP one-on-one coaching was the community. Our clients saw results, but they were doing it on their own. Yes, they had their amazing coach, but they weren’t going through it with someone who was also experiencing the same things at the same time. What makes losing weight and getting healthy easier? Having a community of people who know exactly what you're going through to help support you and cheer you on every step of the way. When you have a community, you can hear each other’s stories and help teach other. Community changes everything. All in all, this recent escapade wasn’t all fun and games. And it was worth it. THIS is exactly why I travel. Even when it’s hard and uncomfortable and lonely. Even when I’m scared. Even when monkeys sink their teeth into my flesh and massive spiders haunt my bedroom. Even when I miss the comfort and routine of home and my first world problems. Every challenge, every tear, every monkey bite is worth it because with the traveling trials comes opportunities, new connections, growth, and refinement. I’m different than when I left for Bali. I’m different at the end of every adventure. This parallels my own weight loss journey so much, and the journey that our clients take when they go through our step-by-step 12- month weight loss program. There are difficulties along the way, but when they stick it out, push forward, and don’t quit, they experience radical shifts all the way to their core. Maybe your biggest challenge right now is your weight. And it frustrates and exhausts you to no end. It doesn’t seem fair. You’re at your wit’s end. You’re ready for change. Maybe it’s the same 15 pounds that you lose and regain, over and over again Maybe it’s 5 pounds. While some of our clients have a lot of weight to lose, many of the people we work with have anywhere from 5 to 15 extra pounds—there’s no amount that’s too much or too little for us to tackle. The reason why is because any extra weight is a symptom, a sign of an imbalance that deserves to be addressed. Whether you have a lot of weight to lose, or you just want to fit into your favorite jeans again, there is nothing superficial about it. The real question here is: How are those few pounds affecting your life? You don’t need to have 50 pounds to lose. If you don’t feel like your best self, then it’s worth addressing, period. You’re not a lost cause, a mystery, or a problem. You’re a puzzle—and we can solve it. I want you to know, this is about more than just food. Just like I said in #1 above, the power of taking life by the reigns and creating the experience you desire is everything. It’s a mindset shift. The people we’ve worked with lose weight, yes—but more importantly, their confidence levels soar, and they step into areas of their life, opportunities and experiences that they never thought were possible! Prepare for a major mindset shift about how you view your body and your life after you reach your goals, not just for weight loss, but in every area of your life. You don’t need to travel to Bali to create your own adventure. You have the power to change your everyday from right where you are. This class teaches you the exact weight-loss strategies we have used with our clients for the past 10 years. You can learn the steps that have helped thousands of women finally shed unwanted extra pounds – and KEEP it all off for good. 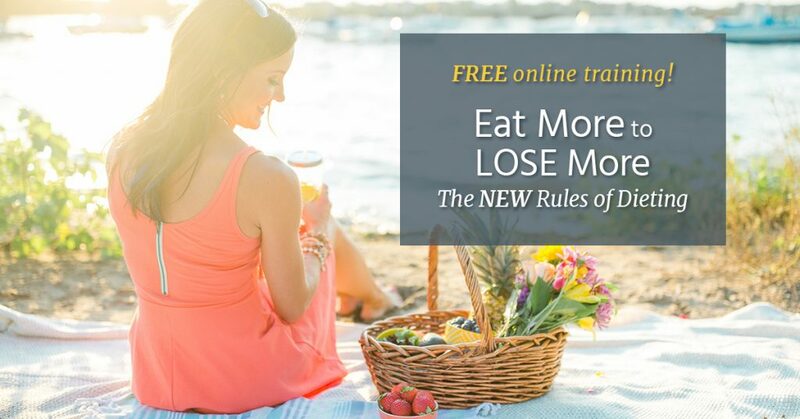 If you are ready to stop dieting once and for all and you’re serious about getting off the emotional and physical dieting roller coaster......then hop on my FREE online training! You can do this and I can help!